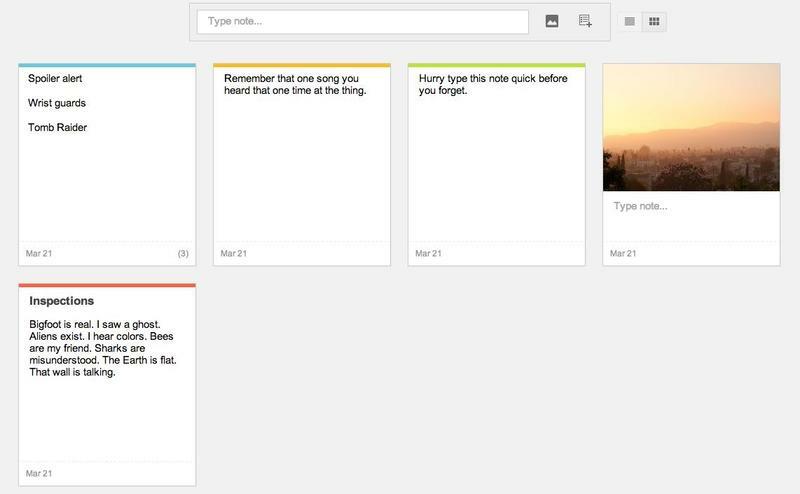 Google Keep is as simple as note-taking gets. Jot down a list, a thought, or a quick reminder and hit save. That's essentially the gist of Google's new service, which is tied to Drive so you can access those notes from anywhere, even on mobile (only available on Android for now). Even in its simplicity, Google has built something that's very effective, and smartly designed, too—mostly. But will it oust popular services like Evernote? Nope. Perhaps that's by design, though. The format of Keep couldn't be more minimalistic. When you first visit the site, you'll see a single white bar encouraging you to start your first note beside Insert image and New list buttons—that's it. The default layout is a single column running down the middle of the page, like a typical blog roll. But you can change that to display a grid, which is reminiscent of Pinterest's famous layout, and allows you to see more at-a-glance. Simple, easy to follow, and very straight forward. Oh, but why can't we organize notes under specific tags or, like in Evernote, nice little notebooks? Very frustrating. Keep adds color coding to the equation to help better keep track of what's what—like flagging emails—but, unless you have a streamlined system, organization of a lot of content can be struggle. Maybe that function will come later, but for now Keep users will have to deal. It can be especially difficult if you want to put a number of different related notes under something like "Feature Ideas." I could tack a specific color code to only feature ideas, but down the road, there will be only so many colors to choose from for other ideas—and that system also hinges on me remembering what color is for what. Google minimizes this ever so slightly with a search bar, but that's it. In addition to adding notes, you can upload pictures (though you can't import from the Web) and make simple reminder lists, such as what movies to watch or what you need from the grocery store. Beyond those core functions, Keep's functionality doesn't extend much further than a simple yellow sticky note. That might not be enough for some power Evernote users, but for those who haven't quite formed a habit around competing services, Keep couldn't be simpler. If you spend any significant amount of time on the Internet, you know how fleeting important thoughts can be. Keep is essentially an online yellow sticky pad, but prettier and faster. Android users get the benefit of an app—you can add it as a widget to either your home or lock screen, too, which adds convenience. The app experience is almost identical to using Keep online, with a single column or grid view, the ability to quickly upload photos, and even jot down notes through voice dictation. I've never been able to establish a consistent habit of scribbling down things I should read, or watch, or eat. My thoughts are too scattershot, and even the notes I do write down don't make much sense. But I'm going to give it a shot. I enjoy Keep's simplicity, and with a little bit of refinement, I could see Google's new service evolving into something even better. Right now users only have options to archive and delete notes; down the road perhaps we'll see a more seamless integration between Google's many services. Keep certainly isn't for power users, but it only just launched. Save a photo here, write down a note there, and nothing more—for now. Whether it'll attract a big enough following or face the spring cleaning axe of Google remains to be seen.